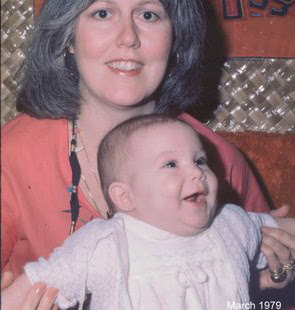 This image of mom and my four-month-old chins appeared before human eyes for the first time since '79 on Wednesday. On Thursday, the only in-hospital shot of me and the fam on my real birth day I'd ever seen developed, too. Hallelujah, dad bought a slide scanner! (Mom looked quite pooped from giving birth to a toddler-sized baby, so I'm sparing her the public viewing). There really aren't many of mom and me because she was always the one taking the pics and telling me to strand up straight. So, this is quite a treat! 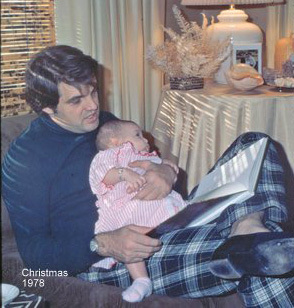 Another product of the slide scanner, which highlights the wrong holiday (and the wrong parent) on Mother's Day Eve: dad looking pretty sharp in his slips and tartan pants on my first Christmas. He was always sweet enough to read us books before bed every night when we were little - and to scan fun old photos for us when we're big. Thanks for sending these over, Daddy! For more notes on Lana Hovey, check out this from the archives. Happy Mother's Day!! wow. That's cool. You can really see the family resemblance.